When I first came in to the CDC, a guard's job was simple: unlock us in the morning so we can function and lock us up at night. The rest was living simple and every once in a while someone would get stabbed or jumped, but the violence ratio was 10 times lower 25 years ago. But now times have changed. For example, a few weeks ago, a prisoner was being yelled at by 2 corrections officers. As the non-English-speaking prisoner was sitting on the bench, trying to understand what they were saying (they wanted to know his name), without any cause or reason, the 2 COs started spraying him with large canister sprayers of pepper spray, soaking his entire body, and then started beating him with little telescopic-like batons with a lead ball on the tip (very painful). Afterward, he was kicked while he was lying on the ground, and placed in handcuffs and escorted to a vertical coffin-like holding cage. I stood at my cell window and observed this, among many other incidents. When I was in Salinas Valley, housing unit number 5 (also known as "the dirty nickel"), the COs would yell racial slurs, profanity, and anything disrespectful towards the prisoners over the intercom. When I was there I counted 115 acts of violence against prisoners by COs and on one occasion I observed a CO tell one prisoner to assault another prisoner or he would tear up his cell. The prisoner complied out of fear of reprisal. I am writing this to educate you and hopefully many others of the mistreatment and abuse of the COs, currently named the "Green Wall" due to the fact that all of the correctional officers wear green uniforms. The main gist of the Green Wall is to keep total control over the prisoners by encouraging them to maintain violence and animosities with each other. The Green Wall will use any and all tactics to maintain that control. Sometimes a prisoner may try to stand up for what is right, but no one will join him or support his cause because the majority of prisoners are in constant fear of getting property (photos of family) torn, damaged or destroyed. My hopes are for everyone to be on notice. Be vigilant, be aware, and let's stop being entertainment for the Green Wall. Let's start figuring out a way where all the prisoners can come together. The mainline GPs [General Population] are outnumbered by the SNYs 3 to 1 because the GPs are inventing new reasons to attack their fellow brethren and make them run to the SNY (Sensitive Needs Yards). All I'm asking is that all come together and repair and change what the Green Wall has caused. All it takes is that one voice to get it started! or an incisive definition of the new world slave? for those 400 years, how will you ever be paid? That approved a gun law, cause they been letting whites kill us! white people can kill ten at a time, and just blame it on the economy! And the simple mathematics subtract, only 1/4 of our race! 3/4 of my all unbearable, for any oppressor to stand. Why you be putting platinum and diamonds, on the master invisible chains! As we marked the anniversary of the uprisings in Oakland that were sparked by the murder of unarmed Oscar Grant while face down on the ground by BART(local transit) police, no justice has been served. An anniversary vigil was held on New Year's 2010, but the crowds and energy had dissipated from a year ago. This may have been a result of weed and video games, but we think it may have been the left wing of white nationalism who did the most to defuse the resistance. 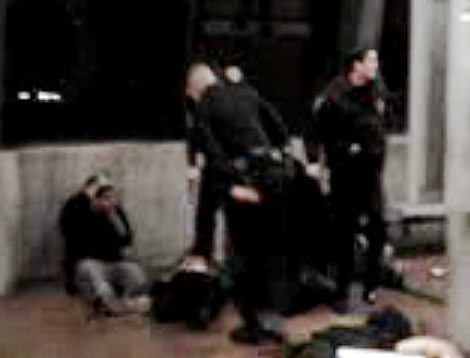 The vigil was held at the Fruitvale BART station where Oscar Grant was shot on New Year's 2009. Upon my arrival I saw police surveiling the vigil. I also saw news organizations with their cameras video taping. I had a rag covering my face partially to keep from being taped by pigs. The head of security, which was being run by the Nation of Islam (NOI), approached me and gave me a little trouble. Apparently they thought the rag on my face symbolized the acts of rebellion that took place last year in response to the murder and they didn't want a repeat. If they were concerned with the security of protesters and not property they would not facilitate the pigs surveillance efforts. Later, people met up at the Humanist Hall to continue the vigil for Oscar Grant. The pigs came sure enough, but what was interesting is that the same NOI persyn that approached me was hugging the pig "Negotiators" (which was written in big letters on their jackets) who showed up. This seemed to indicate a higher level of collusion between event "security" and the pigs than we saw last year with CAPE running around trying to keep people from confronting police or any other symbol of wealth and power. How are people supposed to organize safely in a space openly infiltrated by police? The same people who shot Oscar Grant in the back!? If groups like NOI and CAPE don't keep the pigs out then all they are doing is serving to pacify the people, not secure them. The first speaker spoke what I feel to be a criticism of the people there. A divide and conquer tactic straight out of the government play book saying that people there had different agendas, as if we weren't there to support Oscar Grant and work for change. She criticized others "agendas" while preaching a pacifist line, and insisting that we be led by the Oscar Grant family in the fight for justice. By labeling others lines as "agendas" she tried to delegitimize lines opposed to pacifism, while pretending her agenda didn't exist. History has shown that the oppressor will not loosen their grip without the oppressed rising up in arms. This was the only significant event we know of to mark the anniversary and it was dominated by those who saw no need for fundamental change. After that, the NOI ministers got up and preached a revolutionary gospel. One NOI minister made the point that its the gangster or thug that needs to be organized for revolution and that they will be the ones to fight and win freedom. On the surface this was the speech that resonated most with the MIM(Prisons) line, but the NOI and their offshoots like the New Black Panther Party have been consistently petty bourgeois in their practice and line since the murder of Malcolm X, despite rhetoric to attract the lumpen to their ranks. The rcp=u$a got up and talked about communism and atheism bringing a pseudo-anti-religious perspective to the debate. They said something very interesting. They said that we shouldn't criticize the movements but just get in there and lead the movement. This makes no sense. Criticism and self-criticism is at the root of dialectical materialism. Which is why the rcp=u$a continues to fail to be seen as a viable vehicle for revolution. The latest on the case are that the shooter, Johannes Mehserle, has been charged with murder, but the case has been moved from Oakland to Los Angeles. Mehserle is out on bail with the support of police unions that are backing his defense. So far there has been much to see as the case develops that has exposed the vast injustices of the system, but the battle to convict Mehserle itself is not so strategically important for us. The state has much more invested in the outcome of the case. A conviction would be the first murder conviction against a cop in the united $tates. A failure to convict could prove problematic for them, and the reverberations will likely now be in both Oakland and Los Angeles. We encourage strategic legal battles as a form of struggle in order to expose the system and create room for the oppressed to live and organize. Simultaneously, we are clear that the injustice system is not fast nor even effective. What is more important is learning organizing lessons from what happened around the struggle for justice for Oscar Grant. Two detailed papers have been well-distributed on the topic. One is by a group of anonymous anarchist writers, another is by a self-proclaimed "Marxist" group called Advance the Struggle(A/S), that is focused on uniting the "working" class. Comically, the rcp=u$a who got up to condemn analysis and criticism of the movement are outdone here by a group of self-proclaimed anarchists. Let us begin with the anarchist discussion, as we largely addressed their line in our original article on the riots. The anarchist piece is mostly a story, and probably the most complete documentation of what went on those days in January 2009. Both papers did a thorough critique of the non-profit/reformist coalition turned police that we touched on last year. The Coalition Against Police Execution (CAPE) imposed it's "security" on a large spontaneous movement. While this was an inappropriate role for them to assume, it should be noted that CAPE's organization gave it an advantage over the disorganized angry crowd. And while the anarchists recognized CAPE members as their friends in social life and A/S sees them as workers duped by non-profits funded by imperialism, they were really representing a clear class position of the petty bourgeoisie. They served to protect businesses and prevent conflicts with the police as a matter of principle not a strategy of struggle. As the anarchists pointed out, riots (can) work. We can't get free by rioting, and in many cases riots end in more repression and no gains. They are not a strategy to be promoted as the anarchists do. But in this case they put more pressure on the state than hugging pigs, holding vigils and asking for "police oversight." What those nights represented was a budding system of justice outside of the established imperialist order. Meanwhile, the non-profit/reformist movement did much to pressure the existing institutions to prosecute Meserhle and reform the policing system to defuse independent justice. But if we want to stop the killing, what the oppressed need are their own institutions. An institution is something that is consistent that we can rely on. Not something we pray for every day and emerges in an eruption of undisciplined energy once every 5 years. The anarchist authors are avowed focoists, claiming that "our actions create a contagious fever." But as we said at the time, "nights of Black youth roving the streets among groups of riot cops, being videotaped and snatched to prison cannot continue much longer." And to the anarchists disappointment, it did not. Power must be built and fought for, it is not something we can just reach out and grab. We promote a strategy that depends on deep political understanding among as broad a population as is sympathetic to revolutionary change. Advance the Struggle agrees with this, but their assessment of who is sympathetic is stuck in outdated dogma. A/S opens their paper, "Justice for Oscar Grant: A Lost Opportunity?" claiming that the "working class people of Oakland... found an inadequate set of organizational tools at their disposal." Who are they talking about? It's not "workers" who are being murdered by pigs, it's oppressed nation youth. The anarchists at times also fall into this dogmatic analysis by talking of "those of us who toil in Oakland." Just because Oscar Grant had a job doesn't mean this is a battle between the workers and the bosses. The most interesting critique in the A/S piece that we have not seen elsewhere is regarding the so-called "Revolutionary Communist Party - USA" (rcp=u$a). Again the main point of A/S is that there was no vanguard in place to lead the movement for justice for Oscar Grant. Here they address the rcp=u$a's lame attempts to play this role. They correctly criticize the rcp=u$a for setting up the students they organized to fail, which had the effect of diffusing further militant organizing among oppressed nation youth because their leaders were in jail. Their vague, nonexistent, and false political line and failure to correctly organize for revolution plays an integral part in the imperialist plan to keep the people disorganized and divided. As we mentioned last year, the Panthers were a common topic of discussion as the budding movement faced a leadership void. A/S made some correct analysis about the way the Panther legacy has been transformed into a justification for non-profit/charity type organizing. This is reinforced by founding and leading members who still get a lot of respect in the Bay Area. The anarchists also provide an elementary discussion of the Panthers in their paper. While both groups of authors turn around and condemn nationalism, this experience demonstrates the need for it. Everyone lamented the lack of the BPP, the Maoist, Black nationalist vanguard of the late 1960's. Today we have the Nation of Islam dominating the role of Black nationalism. Nationalism is relevant because it is the oppressed nations that are targeted by police terrorism and concentration camps. Nation-based organizing is the best path to get us away from the non-profiteering and the dogmatic "worker"ism that has so clearly muddied the waters in this period of struggle. The experiences in Oakland reinforce the Maoist class analysis and the importance for having one. The petty bourgeoisie has dominated the movement for justice for Oscar Grant, while white nationalist revolutionaries vie for influence from the sidelines. Justice for Oscar Grant: A Lost Opportunity? 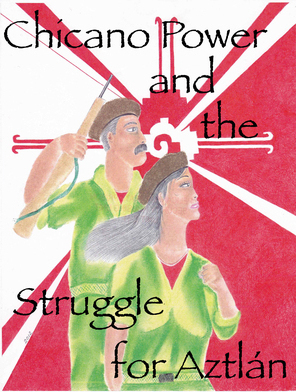 by Advance the Struggle. 2009. Unfinished Acts: January Rebellions. Oakland, California 2009.
but not as they say. I am currently being housed in a maximum facility in the Arizona DOC where I've been confined to a one-man prison cell for over seven years in 23 hour a day solitary confinement. I was sentenced to precisely 156 years for taking up arms against a corrupt judicial system. One of my ultimate goals is to help shed some light on the inhumane environment that those of us in prison are subject to live in "generation after generation." Those of us who speak out against capitalist, imperialistic injustice are kept silent and retaliated against in prisons all across the world. We're kept isolated in boxes about the size of dog kennels for years. Rehabilitation only comes in the form of one's personal dedication of adopting a military mindset and achieving what is essential to keeping oneself afloat and not consumed by the burden of being taken for granted as human beings. It's very common to become invisible in any society designed to desensitize and demoralize the average person, designed to corrupt and eat away at some of the greatest minds. Inevitably, the mental disease surrounding this establishment consumes the vulnerable-minded completely and has its effects on those stronger and competent minds. No amount of love or money can ever replace one's lost time or sanity. Oddly, some of these same people return back into society with no real plan on how to cope or withstand even the smallest pressures. Sadly, I witness people deteriorate on a daily basis while imprisoned, what could have been a short-term prison sentence often ends up a lifetime scar. I've always resented the idea of one resorting to drugs as a means to emancipate oneself from the difficulties, but as you can see when dealing with the shamefulness of the imperialist system, I really do understand why my equals would rather be intoxicated than face a reality in which we're born into a cycle of destruction. However, one fact that will never change is that drug abuse only hinders and destroys one's personal experience to grow in strength and wisdom. Our ancestors weren't quitters nor cowards. We're skilled, imaginative, intelligent engineers and ultimately we adjust to our problems to overthrow our challenges. Yet we remain students to our own neglect; show us a meaningful purpose to our civilization and we will keenly follow. In July 2003, I returned to the Arizona Department of Corrections to spend approximately 156 years behind bars for taking up arms against a corrupt Tuscon Police Department in self-defense. I was immediately placed in Arizona's super-maximum facility (SMU-I,(VCU)). SMU-I is a facility that publicly houses "the worst of the worst" special management prisoners. 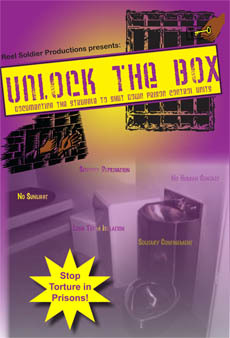 Prisoners are able to obtain some personal items but conditions in SMU-I are very restrictive and inhumane. I was housed in VCU, which is considered isolation within solitary confinement. Ordinarily, prisoners who are held in VCU are labeled disruptive while housed in SMU-I or have accumulated serious disciplinary violations while in prison. Most prisoners in VCU are labeled disruptive for choosing not to conform to the collective ways of the prisoncrats and in return are retaliated against. One of the many tactics used by our oppressor is to place us in the tortuous shadows of the severely mentally ill to help break a person's spirit. I was placed in this unit upon my initial intake into the penitentiary, never once expecting for my oppressors to provide me due process before being admitted into this unusual world. During this particular part of my life a lot of soul-searching was done and ultimately strength was gained. These teachings have allowed me to fully comprehend my ancestry's mantra of "what doesn't kill us only makes us stronger." For long periods of time I debated with the idea of suicide. It was at my lowest point in total darkness and hopelessness that my eyes were truly illuminated to the ways of this injustice system. At this point I chose to continue my life, to have life. The nightmares that keep me from advancing forward, I've confronted and compromised with. But as you can imagine, I found myself in a tight spot, being the VCU unit. I was placed on a gurney while four correctional officers escorted me to my new cell. I was strip searched, placed in extra-tight handcuffs with an additional dog chain that offered my captors an object to manipulate.The officers who were escorting me decided it was essential to assert themselves aggressively. I was pushed face down on the gurney and was advised if I looked sideways or moved even just slightly I'd be pepper-sprayed, tazed and neutralized by the police K9. I knew in the back of my mind this was a familiar tactic embraced internationally by my oppressors so I closed my eyes and kept my mouth shut. It is these types of incidents that inspire me to vigorously overcome fierce adversity. In prison, life goes on but one never gets comfortable with the demeaning environment, the torture, the food poisoning, the searches, the depression, the yells, and the screams. It is what brainwashes us into what we are. I was wrongfully convicted by a judicial system that clearly favors the police, the state's prosecutor, and biased, corrupt judges. My best friend, my little brother and myself are all sentenced to die in an institution that shows no compassion. This is the same institution that as a child you become so dreadful of as you watch your father travel through the same system. Just when I thought my childhood couldn't become any more tragic, reality set in. The temperatures in solitary confinement have a strong tendency of remaining freezing cold; my captors figure if we stay under our blankets all day, wishing upon falling stars, the odds of becoming productive prisoners will diminish. I say productive in the sense that we as prisoners should take up the obligation of combating what is inhumane within the injustice system. This becomes a lifetime struggle while imprisoned. What actually appears to be meaningless, in the long haul is actually morally fulfilling. Yet challenging! What we consider to be productive, our captors refer to as "disruptive." In the end all we want is equal opportunity. Many tactics and well practiced strategies are put up like road blocks. This has given our captors an everlasting advantage. One important method of abuse is the placement system. Our captors have the authority to move prisoners at will. The sycophants usually end up in "Disneyland" while the "disruptive" end up in "Alaska". With this tactic our captors maintain control. The majority of prisoners housed in VCU are seriously mentally ill. Banging on cell doors creates insomnia, the lights stay on all the time, and some prisoners become extremely delusional and schizophrenic. Mental illness has a strong desire to befriend the next prisoner's addiction, as if the air was contaminated with dementia. All different types of crazed thoughts are fabricated in these prisoners' minds, where everyone around you acts suspiciously like an assassin. These types of delusions commonly progress and eventually their pressures become too overbearing to hold inside, forcing these prisoners to act out. Prisoners lose their minds and begin mutilating themselves to ease their mental pain. Suicide is still viewed as cowardly, but some are too overwhelmed to escape its treacherous snares. The main instigators are often the ones who are employed to implement corrections. They introduce this type of behavior to intensify the mental strain, giving the vulnerable a reason to simply attend to their anger, frustration and pain. Sometimes they even use seduction as a defense mechanism or to infiltrate the lumpen organizations to create conflict. This misconduct usually creates disagreements, cell extractions and the like. I myself have continuously remained in long-term isolation. No effective adjustment programs have ever been offered to us in this Arizona maximum facility, so obviously this type of behavior continues to worsen. The truth is solitary confinement is creating its own demise. Since I have been in isolation, the VCU ward I spoke of has been deemed unconstitutional by the higher courts and has publicly been shut down. I am grieving the techniques implemented by the Arizona Department of Corrections in regards to long-term isolation without adequate recourse for mental health treatment. It is detrimental to one's comprehensive health and in due time deteriorates one's ability to function as a human. ADOC utilizes a detrimental structure which it abuses in its discretion to maintain order, rather than to address rehabilitation/recidivism concerns. Long-term isolation without adequate and the effective recourse increases the risk for prisoners to develop extensive mental health disorders and physical health problems as well. This also recruits and increases additional mental health cases for those prisoners isolated amongst the severely mentally ill population for long periods of time. ADOC has neglected to provide adequate mental health services in their maximum custody facilities. What this atrocity does to the environment is create a breeding ground for psychosis. ADOC has strongly neglected to conform its system to reduce recidivism and in fact has demonstrated through their actions, a crime against humanity by converting prisoners into mental health patients, consciously capitalizing on prison enterprise by neglecting to provide adequate recourse for their maximum facilities. This makes prisoners worse off than when we initially arrived, creating a more fortified cycle of sociopaths. This is a logical fact and is very inhumane. Without the adequate learning tools this process is going to keep creating insanity. I have sent MIM(Prisons) a letter of grievance for use by CDCR prisoners. Its purpose is to petition the Director of Corrections to investigate the purposeful failure of the 602 procedure [California Department of Corrections and Rehabilitation grievance process] within California State Prison - Los Angeles County. This is something somebody put together for the general population here on C-yard. It is our intention to flood the Director's office with these petitions in hopes that it will shed some light onto the illegal acts in which these pigs are willing participants. We are being forced to file these petitions due to the unfortunate fact that the vast majority of our 602s are not being filed or properly heard. The idea is to distribute this petition to all CDCR facilities and to have as many people sign and mail the petition to the Director's office as possible. Once all parties receive their responses concerning the petition, all responses along with contradictory paperwork should be sent to the Prison Law Office (which is specific to CA), the Office of Internal Affairs, etc. Our goal is to expose CDCR, its administration, and facilities as tools of repression and the lengths that they will go to to cover their crimes. If correctly done, this action can be one in which quite possibly hundreds or thousands of prisoners will have the opportunity to make their voices heard and their wrongs known. It will be very hard for the Civil Rights Division of the Dept. of Justice and other agencies to ignore us. At worst, if we still fail, then we will at least have further proven that this "justice" system is not for us but against us. My hope in sending this to MIM(Prisons)'s legal aid clinic is that you will redistribute this petition to those working with MIM and explain the concept to our comrades struggling from within so that we may all work together as one in a concerted effort to expose and hopefully create favorable conditions for the masses concerned in whatever they may be struggling for. I think that what I'm proposing here with the coordinated form of "legal attack" is of course a good use of MIM's legal aid clinic time and it would benefit all prisoners, not just in California. In order for the rest of the prisoner population held in different prisons to correctly use this petition, they will of course need to change the name of the facility to that of their own. They will also have to look up their own "Departmental Operational Manual" citations in order to be in compliance. Someone will also have to take the lead for everyone in their facility, individual yard, etc. MIM(Prisons) Adds: We see this campaign as a great use of our resources because our ability to fairly have our grievances handled is directly related to preventing arbitrary repression for people who stand up for their rights or attempt to do something positive. Spreading revolutionary literature, including Under Lock & Key, is a huge part of MIM(Prisons)'s organizing work. We support this petition in light of our anti-censorship work and anti-repression work in general. We have sent this campaign to our United Struggle from Within and Prison Legal Clinic comrades in California, but this is an issue that should be spread to wherever it is relevant. Prisoners outside of California facing similar problems may be able to re-write the petition using their state's citation and policy numbers. [Ed.- A comrade in Texas has already translated the petition for use in the TDCJ system.] You will also need to research which administrators the petition should be sent to in your state. Write to us if you want to work on this campaign in California or elsewhere! February 1, 2K10 I will start my suicide hunger strike. I am tired of being transferred, regardless of my psych/schizophrenic suicidal bipolar background. I figure at 1-2 months they should consider moving me to a hospital here at Dixon. I figure I will lose my voice at anywhere from 3-4 months. At 5 months I will be completely weak, the only muscles I figure will be able to move are my eyes. I have NO family or relatives, NO one. Besides, I am sure I am ready to go. The Assistant Warden Dirk Deuce and Warden Mrs. Nedra Chandler were informed of my suicide strike on January 4, 2K10. I also notified the court of claims of my plight/demise here. In fact, the courts might be in shock because I told them I am planning to kill myself. I have nothing to lose or gain. My death is for my own dignity, respect, and love. My sacrifice is in my best interest. The reason for my suicide strike is because it is not likely I will ever have a cellie here or anywhere else. Moving me from one place to another will stop as of this letter. From here until I die, I will control my last months of 2K10. I see death as a good thing for me. People will try to talk me out of it, but this is stupid. Trying to talk me out of this is futile or useless. I am taking my own life because it is in my best interest. Not only have I had many dreams where I take my own life happily, I feel as though I am going out/leaving with a degree of power and respect. Also I know for a fact that I will leave this year. The only way to keep me alive is to force food and water into my body. I do not want anything or miss anything. I am sorry I will no longer be around to help MIM(Prisons). I love MIM(Prisons). MIM, I love your newsletters. I do not want to go off talking about the newsletter but I believe this is the best newsletter I ever got. I have received many educational books and theory from MIM(Prisons). I loved the poetry. I never liked poetry before. I love your Spanish network news. I am self-educated, through MIM's help. I am sorry I must leave you and everyone. It is in my best interest. If these people do not transfer me to building 38 before February 1, 2K10 then it is too late. I will not go back on my word. Feb. 2K10 is me all the way. I hope they do not try to force food and water down my throat; I will resist. They have until the end of January to make a move or else. Please forget me if this is my last letter because I will not be in my right mind. I love and respect all of my MIM brothers and sisters. But most of all I love myself, even though I will take my own life. MIM(Prisons) Responds: We received your letter from earlier this month about your planned suicide hunger strike. We hope you are still with it enough to read this letter, and are willing to hear us out. We are not blind or numb to the horrible, tortuous effects of the imperialist injustice system, and we understand that there are endless reasons why someone could be driven to suicide. This is especially true if you are trapped inside the belly of the beast, in one of the cruelest manifestation of capitalism, inside of a u.$. prison. We are not writing to tell you that you're exaggerating your despair, or that you shouldn't kill yourself because of some mystical reason like "sin." We are writing to remind you that your life is very valuable to the struggle to stop the same exact cruelties that have led you to this decision. We encourage you to become more involved in revolutionary struggle instead of suicide. With this letter we have sent you an article from MIM Theory 9: Psychology and Imperialism entitled "Disavowing Suicide: Testimonial of a Woman Revolutionary." Her life experience may be somewhat different from yours, but her ability to turn her life into something useful for liberation and revolution is the same. On page 41 of the article the author writes, "I remembered the Sartre quote in which he says that if you are not working on behalf of the oppressed, you are accomplice to their oppression." I think this quote is significant because it shows the political character of suicide. You wrote that you need to kill yourself to maintain some dignity and respect, but we would argue that you are just holding your life to bourgeois standards that aren't useful to stopping oppression. By proletarian standards, to truly have a life (or death) that maintains dignity and respect, one would have to devote their life to revolutionary struggle and the liberation of the oppressed. For someone like yourself, who supports the struggle against all forms of oppression, to remove your life as a resource from this world is to work in favor of the oppressors. You are helping the same oppressors you are trying to get away from with this hunger strike! In your letter you wrote that you enjoyed the poetry on the pages of Under Lock & Key. This experience might be a good subject to write poetry about. Maybe you would like to write poetry for us? I sent you a poetry guide with this letter which will get you more of an idea of what we look for in poems. note: Also see "Losing Battles," MIM Theory 5: Diet for a Small Red Planet, p.51. As Huey Newton said, there is Revolutionary Suicide and Reactionary Suicide. Most revolutionaries in the First World are suicidal to some degree in that they reject safety and security in favor of fighting for justice. To my people of the free communities of Babylon, as of January 2006, a new phenomenon of fascism has been introduced into the Pelican Bay State Prison in Crescent City, California via the creation of a new "Communications Management Unit" (e.g."C.M.U.") program (affecting Housing Units D1 thru D4). The disciples of Adolf Hitler (our kaptors) have taken the extremes of fascism to a whole new level!! The construction of Pelican Bay's "Communications Management Unit" program is a prototype of the models that have been created in Terre Haute, Indiana and Marion, Illinois of the Federal Prison System. Pelican Bay's new "Communications Management Unit" program has largely been kept secret from the free public, because the implementation of this C.M.U. program was done on an arbitrary & illegal basis, to where our fundamental constitutional protected human rights and freedoms (e.g. "speech, expression, association, etc.") are being violated without any cause for concern on their part. Normally, whenever there is a new program, policy, or rule change, the free public is made aware of it through the "Regulation and Policy Management Branch" (e.g. "Notice of Rule Change") as mandated per the "Administrative Procedure Act" (A.P.A.). But ask yourself this: "why all of the secrecy now, if this new C.M.U program is being implemented in accordance to law?" But nonetheless, since January of 2006 Adolf Hitler's disciples (our kaptors) have begun rounding up prisoners in your atypical "slave catcher" fashion, and then began moving us into the new C.M.U. program without us prisoners ever being told, given a reason, or a notice, as to why we have been designated chosen to be housed in the new C.M.U. program. Neither were we accorded a hearing regarding our new classification & housing change. This act within itself has violated our substantive & procedural due process rights, as well as the equal protections of the law as warranted in Wolff v. McDonnell 418 U.S. 539 (1974); and C.C.R. Title 15 Section 3375. Months later, it was revealed to us prisoners the reasons for us being designated/chosen to be housed in the new C.M.U. program. It was because the Pelican Bay State Prison administrators felt we were "real gangstas" with influence in our alleged gang affiliations, to which we were supposedly utilizing to control, intimidate, and influence other prisoners so they could commit unlawful criminal acts on the behalf of that prison gang. But again, we prisoners were not allowed the ability to defend ourselves, as we were not provided with a hearing, or given notice about the wanton allegations being made against us. Meaning that these diabolical monsters are utilizing a "blanket approach" to charge/convict whomever, regardless of whether that prisoner has, or has not been previously found guilty in allegedly utilizing his influential ties to a prison gang, to control, intimidate, and influence other prisoners. MIM(Prisons) adds: After overturning the illegal ban on MIM mail within the California prison system in late 2008, Pelican Bay began returning all mail from MIM once again in the middle of 2009. As this comrade points out there are no rights for the oppressed in amerika and the continued expansion of control units to repress the oppressed nations is the best example of this. Yo estaba leyendo ULK 10 de nuevo cuando encontré el artículo "El combate liberalismo de Mao muy pertinente en prisiones de PA." Ese artículo fue escrito por un prisionero y se refirió a ULK número 5 del mes de noviembre en el año 2008. Con respeto este artículo puedo decir de toda corazón que compadezco completamente con el autor, porque yo mísmo y unos otros aquí en el Centro Correccional conocido como Richard J. Donovan (RJDCF) en San Diego, California aguantamos el mísmo tipo de chingaderos. Yo estaba puesto injustamente en la Segregación Administrativa de RJDCF por casi 18 meses por culpa de otro prisionero quien me acusó del intento de extorcionarle la mercancía de la tienda aunque yo no lo hice. Aquí, he visto exactamente como la mayoría de los prisioneros se dan las espaldas para no pelear contra la corrupción desenfrenada y opresión por parte de los puercos porque en el momento no les afecta a ellos. Pero cuando las cosas cambian, y la corrupción les toca, ellos de repente empiezan gritar, y exigen la unidad de todos. Para mi, las personas que evitan combatir contra la corrupción cuando les conviene son iguales que los puercos. Es muy patético como ellos solo son preocupados con si mismos. Yo al contrario, por los últimos 16 meses he estado peleando uña y diente contra todos los actos corruptos y opresivos de los puercos. Aunque soy lo que se llama SNY (Yarda de Requisitos Delicados) conocido también como Custodia Protectora, peleo por los derechos de todos los prisioneros sin importar sus afiliaciones, sean SNY o activos de la yarda principal. He hecho bastante apelaciones y he presentado unas cuantas demandas en las cortes. Hago esto aunque todo regresa para perturbarme en la manera de retaliación por los puercos en autoridad. Pero para citar una expresión común de la famosa película Gone With the Wind en inglés o Perdido en el viento, "Francamente querida, me importa un comino." Creo que no hay más que las autoridades puedan hacer para castigarme o hacer mi vida más miserable. ¿Cómo pueden hacerlo? He sido asignado a la segregación administrativa por 18 meses por asuntos no sancionados porque se acaba de descubrir que yo realmente no extorcioné nada de nadie, sin embargo me mantienen aquí por 18 meses por "preocupaciones de enemigos." He estado esperando un traslado no adverso por la mayoría de los 18 meses, por 16 meses más o menos. Los puercos que son más corruptos que nunca siguen andando por aquí como si fueran casi invencibles . Me dan porciones escasas de comida, friegan con la comida y el correo, e intentan callarme con mentiras. Constantemente estas autoridades intentan crear odio y hostilidad entre mi y los otros prisioneros. Pero hasta ahorita yo he tenido la ultima risa. Los prisioneros saben que yo les apoyo y peleo por sus derechos. Ellos entonces no les hacen caso a los puercos. Los prisioneros me brindan su apoyo aunque no todos pelean por si mismos. Además he ganado casi todas mis apelaciones, y las cortes están fijandos en estos asuntos. Por eso, yo no me les arrodillaré jamás a estos puercos sadicos masoquistas y sus metodos de opresión. Aunque sea dificil pelear contra estas fuerzas, a mí nada ni nadie me van a detener. Estos puercos hacen tan buen trabajo en tenernos peleando entre nosotros mismos. Pero aun hay unos de nosotros que sin tener en cuenta su propia estatus custodial, SNY, yarda principal, raza, religión, crimenes, etcétera, quieren dar tanto para tras, sino más, de lo que nos dan. Como ya he dicho, represento el SNY. Yo veo presos activos de la yarda principal peleandose entre ellos mismos. Estos conflictos ridículos contribuyen a su propia opresión y facilita el trabajo de los puercos. La yarda principal considera a los presos SNY como si todos ellos fueran lo más bajo como abusadores y asesinos de niños/as. Y aun hay más unidad en el lado SNY de la cerca. Nosotros ponemos la politica prisionera tonta a un lado. Para mi, es la cosa madura que hacer. Los presos le hacen favores a los puercos con pelearse entre ellos mismos. Y los que no pelean entre ellos mismos les besan el culo a los puercos para recibir favores como drogas, teléfonos celulares, y otras tonterías. Pero cuando algo sucede, estos mismos presos colaboradores exigen unidad que ellos mismos no demuestran. Antes, yo era igual a ellos pero he cambiado. Hasta ahora les ayudo a esas personas porque esta acción todavía es pelear la batalla buena. Conozco unos cuantos que harían lo mismo pero son muy pocos. Prisión sería un lugar mejor si la gente parara de oprimirse a si mismos o a los otros, encima de la opresión de los puercos. Tenemos que dejar las tonterías para trás por una vez en nuestras vidas. Dejar al lado el racismo, el odio entre SNY y yarda principal, las actitudes egoístas, la mentalidad de "todo yo." Necesitamos madurarnos ya chingado. Unifiquense y peleen contra la opresión, contra los puercos, peleen por sus derechos verdaderos. Si no lo hacen, no son nada más que esclavos, títeres, putas. No estoy abogando violencia contra los puercos. Prefiero que lo hagan educandose ustedes mismos, apropriadamente, no con las pendejadas que estas autoridades quieren que aprendan. Historia auténtica, politica genuina, realidad cierta, si existe. Nos enseñaron en las escuelas americanas que el comunismo es un terrible modo de vivir. Cuando las personas que eran comunistas difaman el comunismo es solo porque uno de ellos, normalmente exiliados u otros que fueron castigados, huyeron de la responsabilidad, entonces ellos lo calumnian. Y aun he conocido muchos otros que tienen puras cosas buenas que decir sobre el comunismo. La gente nunca será verdaderamente 100% felices. No todos. Pero la mayoría puede estar bien. Hasta el mismo Mao reconocía sus errores. Si la gente aprende de los errores, estaría estupendo. Demuestra madurez y responsabilidad. Si no, son unos tontos, así de fácil. Nuestros errores son muchos. Rápidamente hemos aceptados un cierto modo de vivir. Fijensen a donde eso nos ha llevado. Nuestra rehabilitación en la prisión es una broma. No estamos rehabilitados, estamos segregados. Y es porque lo hemos permitido cuando lo aceptamos como si fuera la manera genuina. Pero no es así. Despiertense. Fijense entre las líneas. Estamos miserables porque lo hemos permitido. Unifiquense. Echen la mierda para trás en la basura. Eduquense. Parense en sus propios dos pies y peleen en la batalla verdadera. MIM(Prisiones) agrega: El movimiento prisionero al fin de los 60s y el comienzo de los 70s fue fuerte gracias a la unidad de acción alrededor de temas que afectaban a todos los presos. Necesitamos implementar ese tipo de estrategia y no solo concentrarnos en el individuo como este camarada reitera. Está en líderes de ir al frente y dirigir en su enfoque pero ha cambiado. Entre más líderes vayan al frente, más gente cambiará y verán unidad en acción como una realidad. Yo personalmente he tenido complicaciones de salud los ultimos dos años, specificamente infecciones estómacales (dos veces). Me diagnosticaron con H-Pylori (Helico Infección Bacterial) que basicamente viene de comida sucia en los cubiertos. Se sabe que esta infección causa cáncer estómacal si no es tratado apropiadamente. Adicionalmente he estado sintiendo quemazón en las areás privadas, en cual la prisión del estado de Florida y la union correción institución ha continuadamente corrido los mismos examenes, nunca intentando otra forma de tratamiento en cual solo causando que sufra más. Repetidamente me han cobrado $3 por ir a ver el doctor solo para ser negado tratamiento adecuado. El personal medico igual que el personal de seguridad (los guardias) sigen actuando como que los reclamas de mi enfermedad medica es un problema mental y no un problema fisico, hasta que recientemente despues de dos años fui visto por el urologista y solo por el apoyo de mi familia y de continuadas quejas me dijeron que tenía calculo renal. Solo quiero decir que quien seas y donde estes todos podemos contribuir a la lucha para derechos basicos y con determinación podemos obtener o lograr nuestras metas y conquistar.